The machines used for canine MRI scans work the same way as those for humans. An MRI -- magnetic resonance imaging -- scan is a detailed form of diagnostic imaging that allows a vet to see inside your dog. The MRI is similar to an X-ray, but the MRI images are more detailed than those from an X-ray. 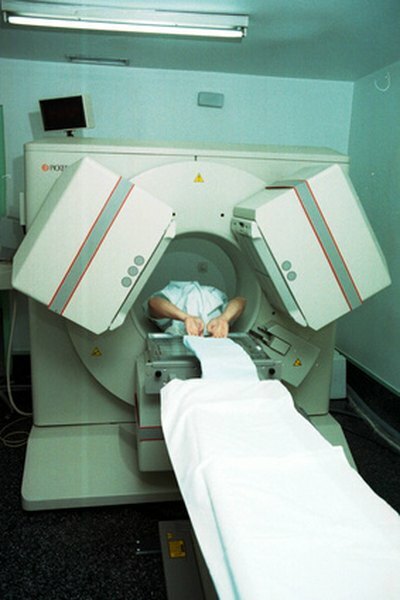 Unlike an X-ray, the MRI does not use radiation. MRI scans are not used very often by veterinarians. Problems with a dog's spinal cord or brain are the most likely conditions to be diagnosed using an MRI scan. Most veterinarians will exhaust more traditional diagnostic options -- a physical exam or blood work, for example -- before ordering an MRI scan. The scan can be useful in diagnosing unseen problems in dogs. For example, if your dog has been having epileptic seizures because of scar tissue in his brain, an MRI can show the veterinarian such tissue is present. In some cases, veterinarians are using MRI scans to diagnose skeletal problems in dogs. The MRI imaging is only effective if the dog stays still for the duration of the scan. An MRI session can last as long as two hours, so your veterinarian will place your dog under general anesthesia before starting the MRI scan. After the scan is complete, your dog will need approximately two hours to recover from the effects of the anesthesia. Typically, the veterinarian and imaging specialist can use this time to make a diagnosis based on the MRI images. As the name suggests, an MRI uses magnetic fields to create internal images of your dog's body. The MRI scanner is, essentially, a huge magnet. Radio waves from the magnet travel into the dog's body, then are released when the magnet is turned off. The released waves are interpreted by the scanner to form an image. MRI scanners are extremely expensive, and at the time of publication were rarely available outside of large veterinary institutions and universities. Dedicated MRIs are smaller machines, designed to make an image of only one part of the body. A dedicated MRI may be designed to scan only the brain, a particular joint or the nasal cavity. The smaller size of dedicated MRIs makes these machines more affordable, and their procedure time may be as short as one hour. Dogs still need to be anesthetized before a dedicated MRI, but with a shorter anesthesia time your dog will recover more quickly after the scan. Do Poodles Have to Get Haircuts? What Tricks Can You Teach to Parson Russell Terriers?